After 7 years of working in the volatile mortgage industry, I learned that it can be very challenging and sometimes entertaining work. It pays well, but you have to put up with a lot of upset borrowers on occasion, and deal with borrowers who are sad, mad, or just plain crazy. Buying a house is undeniably an emotional process (even though it shouldn’t be), and as it turns out, some people get very angry when you can’t get them qualified for a mortgage. I realized that for some reason, people always think they are entitled to get a mortgage, even if their credit is less than stellar. This makes it a tough business to be in because not only do you get angry borrowers calling you from time to time, but also angry realtors and sellers as well. Sellers want to sell, buyers want to buy, realtors want their commission — hey, what could go wrong?? I’ve seen some interesting names, heard about borrowers who wanted to return their houses after closing (no joke! ), and dealt with more than a few jerks. Sound interesting? 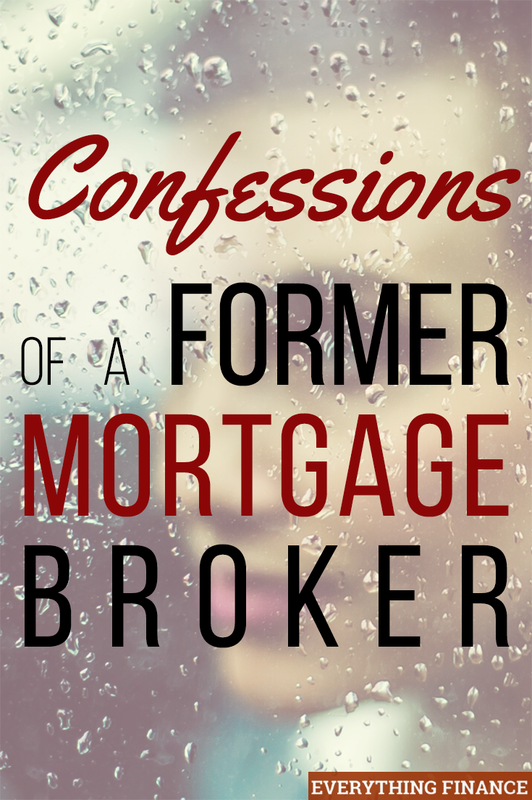 If you want to know what the home buying process looks like from the inside, here are my confessions of a former mortgage broker. There were many times I pulled a new borrower’s credit only to see dozens of credit cards, pages worth of collection accounts, a couple of car loans, and student loans out the wazoo. Sometimes I even thought, This is a foreclosure waiting to happen, or, You really have no business buying a house, but since I wasn’t an underwriter, I had to do what I could to get these people qualified anyway. It was my job, and it’s the nature of the mortgage lending world. They didn’t realize it when they financed their cars, but they nixed their chances of mortgaging a house since their debt to income ratio was too high. It was hard for me to feel sorry for borrowers like that. Some of them just needed a really good credit counselor to set them straight. Some Borrowers are Just Plain Rude…and Creepy! Sometimes common decency flies out the window. I had a borrower once who did not qualify to purchase a home, but couldn’t take no for an answer. Instead of moving on or trying to find another broker, she incessantly called and texted me, even when I was at the funeral of a friend. Telling her I was at a funeral did not seem to embarrass her at all, and the next thing I knew, she was trying to get me to meet her so she could bring me some baked goods. She clearly thought I was trying my hardest not to give her a loan, and thought she could possibly bribe me with some baked goods after my friend’s funeral. Just bizarre!! In another unfortunate incident, I was perusing a borrower’s bank statements (we had to get them for most borrowers), only to find a charge for some inappropriate charges on his statement. I’m guessing he either forgot it was on there for my eyes to see, or he was just plain creepy. Talk about awkward! And seriously, if you can’t remember your last address, please just go ahead and leave my office. So many people would actually tell me they weren’t going to provide me with all of their personal information and, after a few weeks of back of forth about it, they would generally relent and provide me with the documentation I needed to get them a loan approval. First time home buyers, however, typically made a list of what they needed, provided it quickly, and closed just as quickly. Easy! For borrowers who didn’t want to provide so much as a pay stub, I began to ask them to think about what they would ask for if someone was asking them to lend a hundred thousand dollars of their own money. Personally, I’d want rights to their first born and a blood sample, but that’s just me! After the housing crash, the government came down really hard on the mortgage industry, specifically mortgage brokers. There were, undoubtedly, very mant unscrupulous brokers out there, but just as many, if not more, good brokers. The housing crash drove out most of the bad guys, and the ones that were left got to deal with the backlash and subsequent over-regulation of the industry. What irked me the most is that the people who got hit the worst seemed to be the brokers themselves. I saw many of them lose their jobs and/or go bankrupt. If they did manage to make it through that tough period, the government stepped in to make their job harder for them. When the regulations should have hit the lenders the hardest, it seemed like they were coming down on the little guys — the brokers who can only offer the mortgage products that are given to them by the lenders. The brokers are not the ones lending the money, the lender is! The underwriters work for the lenders, not the brokers, but the brokers are the ones who got nailed and blamed for the housing crash. Guess what? Regardless of what you may think, mortgage brokers actually want to get your loan closed. The reason is because most mortgage brokers work for commission only, so they have a vested interest in getting you approved for a loan. If a broker doesn’t close your loan, they may not get a paycheck for that period, so there’s quite a lot of motivation to get each and every loan closed. Many of them work their tails off for you behind-the-scenes as your personal cheerleader, but sometimes it’s of no use if the underwriter won’t budge on a deal. That’s not part of the process most borrowers get to see. I’ve had many conversations with lenders and underwriters over the years that involved begging them for help on a loan, asking what can be done to get a deal closed, sometimes to no avail. Delivering that kind of bad news to a borrower is the worst part of a job. It’s hard to crush someone’s dream, especially when it may be their first time trying to buy a home, or if they have a couple of kids in tow. There were plenty of triumphs, too. From time to time, someone would recognize just how hard I or someone else had worked for them and send a thank you note. That small, but gracious act, would turn any terrible day into a worthwhile one. I also loved watching people get their house keys for the first time, seeing newborn babies with their parents at the closing table, and just hearing the excitement in people’s voices as they talked about plans for their new homes (especially if it was their very first one). Good and bad things aside, the mortgage industry served me well as a career and taught me many very valuable lessons (especially about people and their strange habits with money), but since I’ve left it, I haven’t looked back. What did you think? Did any of these experiences surprise you? Do you have a better understanding of how the mortgage process works behind-the-scenes?